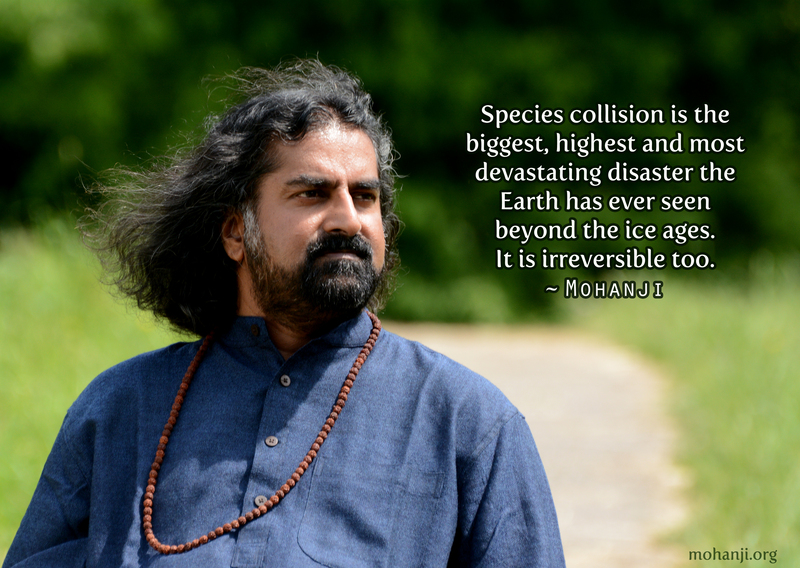 Species collision is the biggest, highest and most devastating disaster the earth has ever seen beyond the ice ages. It is irreversible too. This is totally man-made. No other species on earth trusts human kind. This lack of trust between our species and others is alarming, and crippling our existence on earth. With our insensitive life patterns, we have created such vast fields of distrust between ourselves and all other species on earth. Every human walking on earth is responsible for species collision. It is an inherited curse. This breach of trust started about the same time domestication and farming of animals beyond the boundaries of ethics began. Because of lack of sensitivity, we have lowered the vibratory levels of the surface of the earth. We have violated the harmony of the vibratory plane between other species and men. This is the same equation for both land and sea. We have put our hands everywhere. The segregation of harmony in vibratory levels which can be understood only through senses beyond the usual five, is irreparable in the immediate future. It may take a few lifetimes to achieve this, if at all. The other option is re-construction after demolition. This is the earth’s choice, based on its state. Earth uses natural disasters to equalize the imbalance and make way for re-creation. We asked for it. 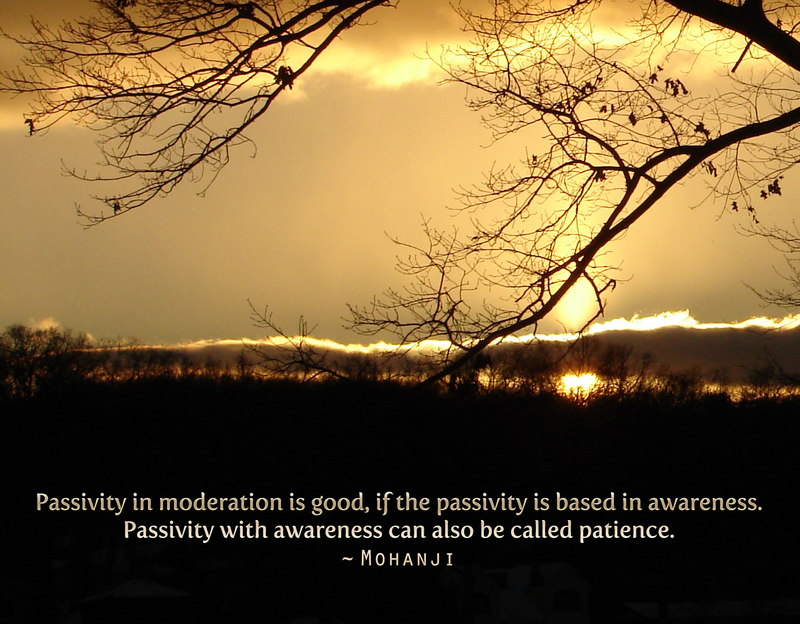 Passivity in moderation is good, if the passivity is based in awareness. Passivity with awareness can also be called patience. Do not be deluded. All humans are not on the same vibratory plane. There are high and low planes of operation amongst people. We can see the subsequent devastation on the world as well. Political philosophies which resulted in human massacres are a clear sign of variety in operational level. Every being living on earth has its own frequency. However, all species other than humans use their own inherent skills rather than external objects, to maneuver on earth. 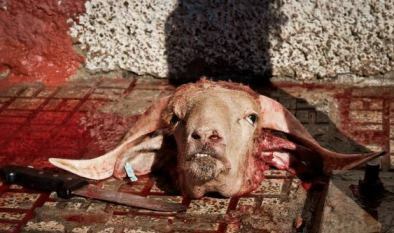 Only humans mutilate, manipulate and destroy beings of other species indiscriminately. Since we do not “feel” enough, we fall through greed for pleasures. Only humans mutilate, manipulate and destroy beings of other species indiscriminately. Since we do not “feel” enough, we fall through greed for pleasures. Man is eternally searching for happiness. 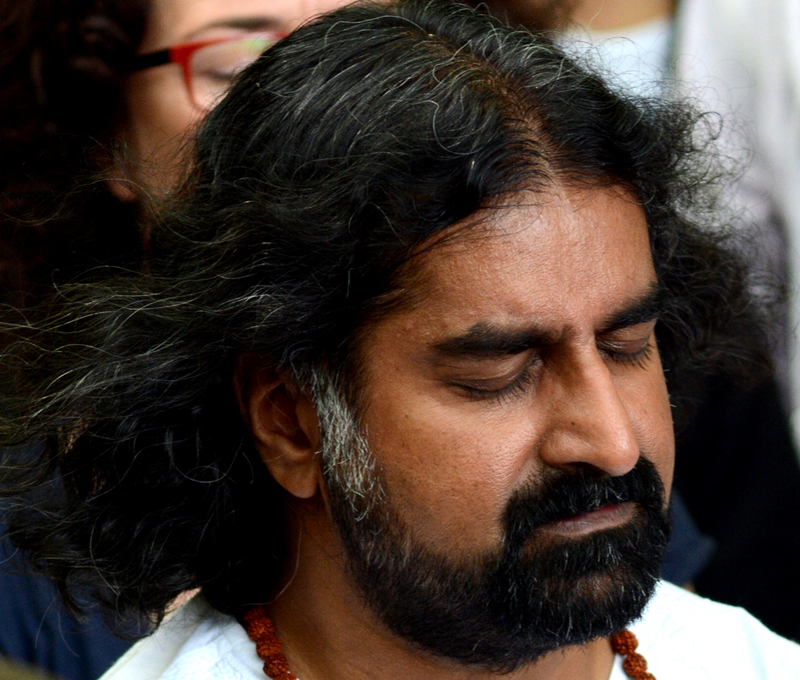 Man is searching for inner silence and peace. He works hard for it. Many times, the weight of lineage and the weight of social karma delays his movement. He strives for perfection. Still there is delay. In between, mind plays havoc. Mind compares, criticizes, judges and alienates man from himself, let alone his guides; banking on a broken concept – often inherited, stored in the mind since eternity. Barriers are many for man to evolve and see the light of truth. 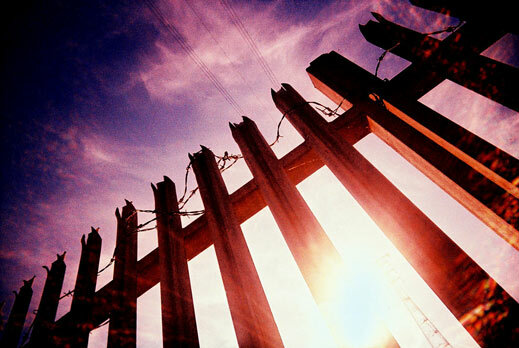 Many barriers are created by oneself and many are acquired from the world. Barriers are many for man to evolve and see the light of truth. Whatever the conscious mind gathers, the sub conscious mind will not necessarily store. What is repeated though, is definitely stored in the form that it is entered. This is just like a computer. We type a message and if we do not save it, it will be lost from the memory of the computer. We are storing in our subconscious only that which we have consciously energized and emotionalized. Likewise, a matter that is stored can manifest again in time, anytime. This can also become your destiny. The world is turning fast. It’s a good time for man to evolve spiritually. What are the factors that are hindering his progress and not allowing him to take advantage of this god-given chance? 1. Mind – When I say mind, I would like to include the intellect and ego. It is the collective mind. Mind is the trash can that contains all the stuff man has acquired over generations, and that he has stored using emotions as the glue. The concepts, phobias, fears, apprehensions, anger, hatred, jealousy, craving, love, kindness, compassion, so on and so forth. This mind-conglomerated rules our life. It never allows us freedom from it. At any given point of our time during our waking state, the mind produces some character trait that is stored in its storehouse, manifests it and thus distorts our reality. We judge, criticize and condemn other people or situations based on that. Usually, when we become negative, we connect with other such people of the same vibratory level. When we experience positiveness, we tend to isolate ourselves. This also means being objective at all times. Beyond the influence of the mind lies real spirituality. It leads to liberation. Nothing constructive happens in an agitated mind. Nothing can be built on ground which shakes. 2. Species – I would call it the burden or curse of our species. We carry the responsibility and burden of being born into the human species. We are superior in intellect. We can manage choices. We can think and act. We can modify materials and we can create new things. So, we are better creators than any other species on earth. Creation comes with responsibility. Destruction amounts to irresponsibility. Destruction of materials and life alike are clear signs of misuse of power at hand. Man has failed miserably to act responsibly. His emotional nature and his greed have damaged his very abode – the earth. The biggest damage of all is the lost trust between species. Man has become totally isolated. No other species trusts man. There is no trust between the animal kingdom and the human kingdom. There is already a split on earth. This has happened because generation after generation, we have captured, tortured and killed beings of other species, as if they were war criminals. We have wiped out many a species as well. We are still doing the same as I write this. The breach of trust which came along with the permission or choice of existence on earth, has become a lack of mental equilibrium for man kind. No peace. No real peace is possible because the atmosphere is filled with victim-hood, torture and bloodshed. When animals began being treated as food materials, bred, raised and killed for the sake of human taste buds, we lost grip on our own conscience. We lost our grip on ourselves. When we kill any being, when we deny the right of existence or shared space towards any being, we are committing a breach of trust. Every being has its character, consciousness. Every being is equal to humans, except in species. Same rights on earth. But, today, no species trusts humans. When we breed, raise and kill them, the trust that they develop for us is also assassinated. They feel that we are benevolent when we feed them on time. They start loving us unconditionally. Then, when they realize that this love was selfish, just for the sake of their meat, they release many negative vibrations into the atmosphere. They feel cheated, betrayed and they die broken hearted. I shall not re-iterate the agony that beings of other species experience in our collective farming, which I have narrated in my earlier blogs (We MUST TALK because They cannot, Velocity of Violence…) But, as man restricts the movements of other beings for his benefit, and as he insensitively wipes out beings of other species for his own trigger pleasure, we are already actively involved in the species war. We may also experience a false feeling that we are winning this war when we kill them indiscriminately, but these atrocities are constantly getting registered in the consciousness of this platform called earth. The final judge is earth. Earth could choose to annihilate the oppressor completely from the face of the earth. Every cry of pain stays as vibration on earth. Everything is registered. We may experience a false feeling that we are winning this war when we kill them indiscriminately, but these atrocities are constantly getting registered in the consciousness of this platform called earth. The final judge is earth. Species conflict is destroying the earth’s vibratory level. Millions of animals and acres of environment are destroyed each moment. This has alienated man and will also bring forth doom to the species. Unconscious food habits, unconscious habit patterns and living unconsciously or emotionally have isolated man from himself. So much is already destroyed in the internal and external world. The wounds of the internal world are reflected in the external world, and the wounds of the external world are reflected as human ailments. Species war has a lot to do with our current state of restlessness, anarchy and lack of equilibrium. This is increasing day by day. Natural disasters have everything to do with the change in vibratory plane. The victim-hood of species is affecting the masses. The restlessness that exists in the air is making man-kind suffer more hurdles in the pursuit of truth. One of the key reasons for our agonies, sorrows and depressions is the change in vibratory level caused by the species war. This is a silent war. Many people may not even realize there is such a war. When we visit the stores and see or buy meat products packed in attractive containers, we hardly realize that consumers of such products are actually sponsoring the species war. The more the demand, the more are the causalities. 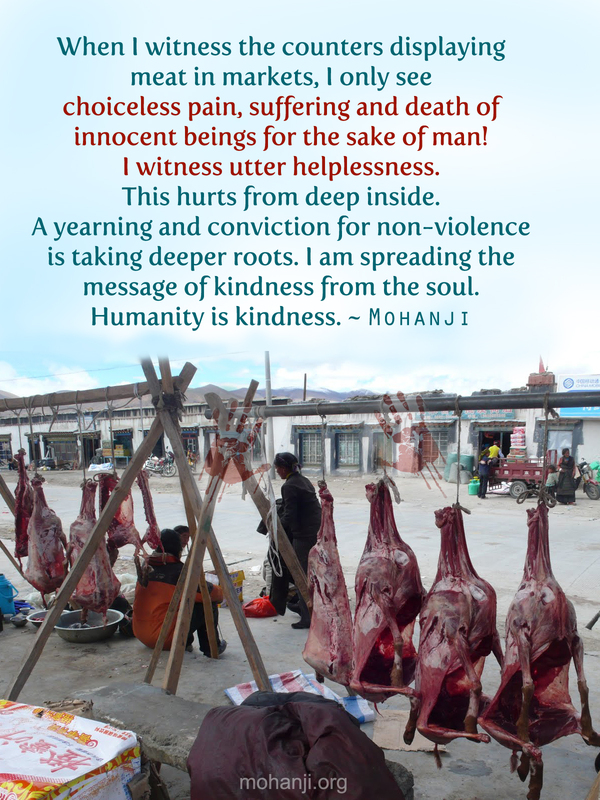 All the beings who are killed for the benefit of humans are not faceless. They had character, constitution and a will to live just like humans. They also had the right to share the earth with humans. They feel the same way humans felt during the holocaust or Pol Pot’s regime. The feeling is the same. Inevitable death! Helplessness! Resigned to fate! Tears! Pain! and Helpless Surrender! Every being of every species that dies everyday feels this way. Trust me on this. The agonies and pains of mankind bear the weight of our crimes towards other species. We must be aware of it. If earth has to be a better place for humans and other species to live peacefully, then co-existence must become a truth. This should be based on respect. There is harmony between all other species except man. A deer understands and appreciates the hunger of a lion. And one from the clan may even sacrifice its life to save the rest and honor the species harmony. A lion does not kill for pleasure. Hence, there is predictability which the other species understands. 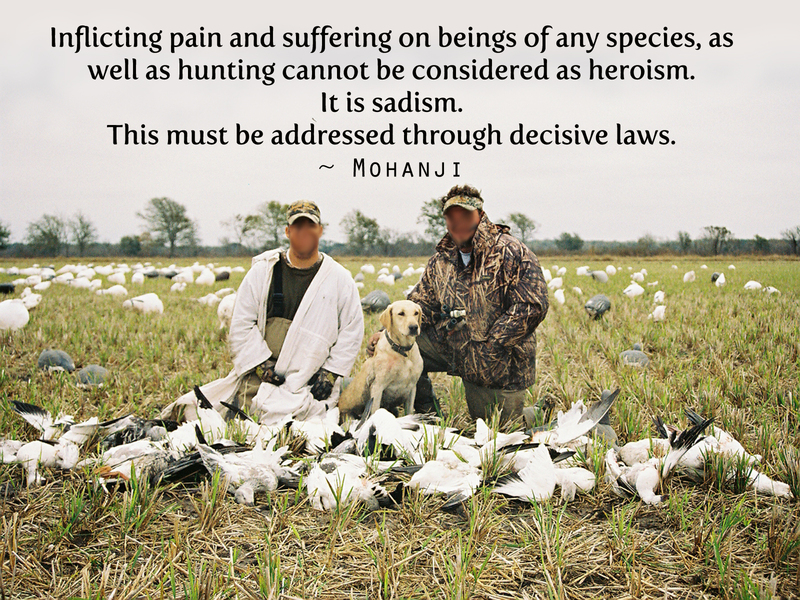 While in the case of humans, we kill, capture, torture and mutilate animals for the sake of our sadistic pleasures. Canned hunting and human-controlled species protection using advanced machinery to reduce animal populations are all signs of our lack of conscience. Nature has its own effective control systems in place. The lions and deer have different breeding patterns, patterns of growth and styles of life including appetite. Grass grows faster and the animals who survive on it, keep it trimmed. When the deer populations grow, lions control them, so on and so forth. When humans breed, there is no sensitivity. They over-populate and take over the world of other species after destroying them. Thus, lack of effort with regards to co-existence has separated the human species from all other species. And the concrete jungles that we have created for ourselves are even alienating us from our own kind. The species conflict has a major role to play in the psychosomatic illnesses that we experience each day. The agonies and pains of mankind bear the weight of our crimes towards other species. We must be aware of it. 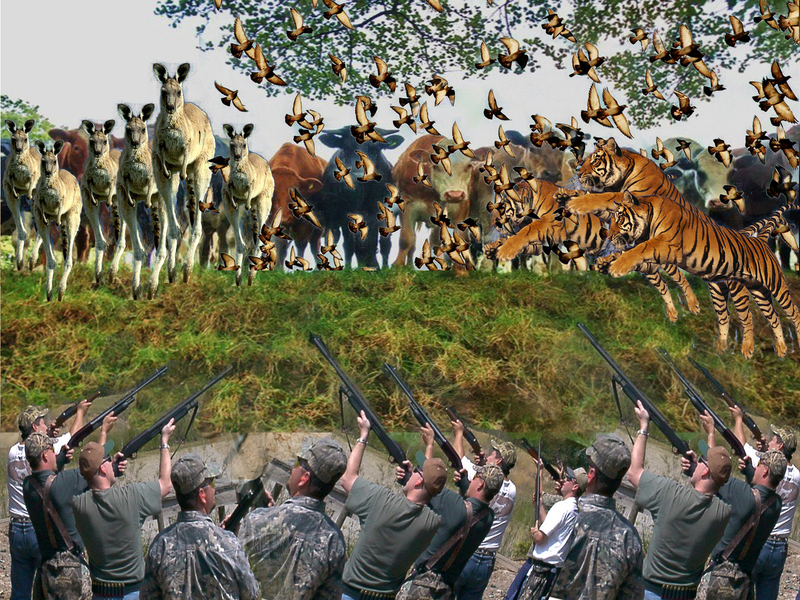 Species war is the largest disaster which mankind has unleashed on earth, with the technological era. The conquests that man has achieved are all external and worthless. He has made no inner conquest and has failed to recognize that the only conquest that is worth a life time is his inner conquest. He did not spend time to build the field of peace within, instead he destroyed forests, the habitat for millions of beings and made golf-courses for his pastime. Lack of awareness is affecting mankind and will continue to affect it. We must do whatever possible to bring back the trust between species. We need to re-unite and re-bond. We need to bring back peaceful co-existence based on respect and harmony. Harmony. This is the key. Inner harmony. And in order to attain inner harmony, all species should co-exist. Nature should be left intact. Life should flourish naturally. Otherwise, expect calamities, inside and outside. I do not like to sound ominous, but this is the truth. This is happening. It will happen more in the coming years. Destruction is bound to happen. Be Aware. Harmony. This is the only way. Inner harmony. your words speak truth, yet so many are unaware and often through no fault or choosing of their own. Culturally, they follow the pack, and they have no reason to believe what they’re doing is wrong. It is heart-breaking. But slowly the awareness is arising, I am hopeful. What else can we do but create with the highest intent on Love, and teach to those with ears, and forgive and love those who are in the darkness. Thank you, Mohanji, for your caring soul. Namaste. 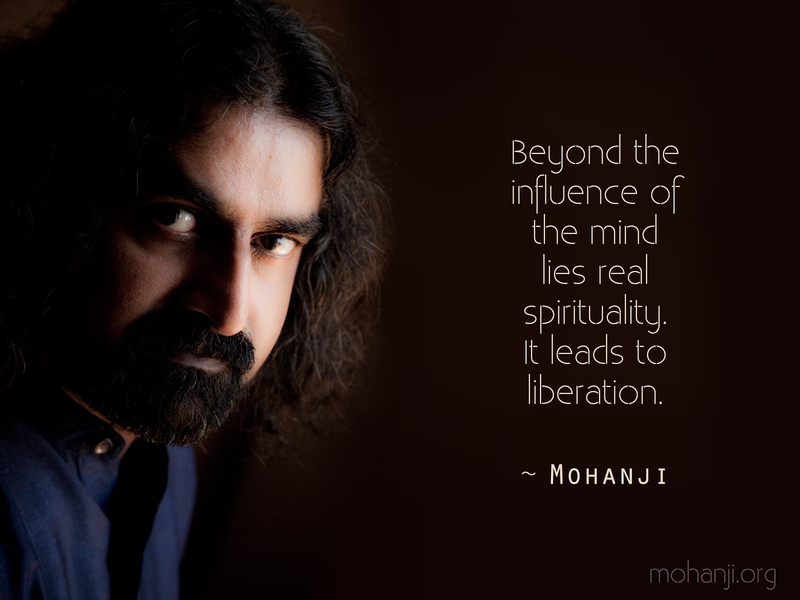 I am really moved by what Mohanji says. I pray that more and more people will understand their violations and move towards the path of Truth. Sometimes I welcome destruction and wish it to happen because I feel anger and pain of betrayed souls. Sometimes I understand that there is no other way for people to evolve but to go through killing, eating meat, etc.. Between those two perspectives, I find my peace. Thank you for your powerfull words! I have been thinking of changing to vegetarianism for quite some time. After reading you I am now fully convinced and firm on the decision to follow vegetarianism hereafter. Feeling blessed for the ability to see and hear you when you are in Delhi. I feel I am in the presence of more than a mortal being, I come away awestruck at your wisdom and at your ability to convey in easy lay man terms the beauty of things ethereal. Truly blessed, thank you does not suffice.